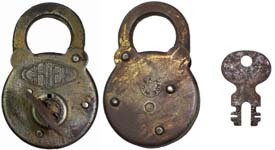 Blank - No Pins - Brass Case - Steel Shackle - Post key. 2 3/4" high x 1 7/8" wide x 3/8" deep. Stamped brass case. Steel shackle. Post key. Blank. 2 7/8" high x 2" wide x 7/16" deep. Stamped steel case. Steel shackle. Post key. Blank. 3" high x 2" wide x 3/8" deep. Stamped steel case. Steel shackle. Post key. Blank. 1 15/16" high x 1 9/16" wide x 1/4" deep. Stamped brass case. Brass shackle. Post key. "6 LEVER". 3 1/8" high x 2" wide x 5/16" deep. Stamped steel case. Steel shackle. Post key. "6 LEVER". 2" wide. Stamped steel case. Steel shackle. Flat split key. 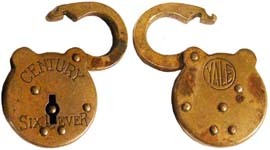 "ACME SIX LEVER" - Flat Shackle. 3 1/4" high x 2 1/8" wide x 5/8" deep. Stamped steel case. 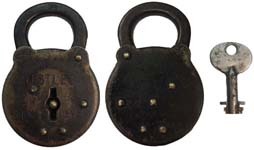 Flat steel shackle. Flat split key. The reverse of the lock is blank. "ALCO". 3" high x 2" wide x 3/8" deep. Stamped steel case. Steel shackle. Flat split key. "B. B. GAS. CO.". 3 1/4" high x 2" wide x 7/16" deep. Stamped steel case. Steel shackle. Flat split key. Mfg by: Eagle Lock Co. Made for: Brooklyn Borough Gas Co.
"BELKNAP BLUEGRASS LOUISVILLE U. S. A.". 3 1/8" high x 2" wide x 7/16" deep. Stamped steel case. Steel shackle. Flat split key. Made for: Belknap Hardware Co.
"BELKNAP No 66 SIX LEVER". 3 1/8" high x 2" wide x 7/16" deep. Stamped steel case. Steel shackle. Flat split key. Made for: Belknap Hardware Co.
"BRITISH MAKE 6 LEVERS". 1 1/2" wide. Stamped steel case. Steel shackle. Post key. "BRITISH MAKE" is stamped on the obverse of the shackle. "CB&QRR". 3" high x 2" wide x 7/16" deep. Stamped steel case. Steel shackle. Post key. Made for: Chicago Burlington & Quincy Railroad Co.
"CENTURY SIX LEVER". 2" wide. Stamped steel case. Steel shackle. Post key. "YALE & TOWNE MFG. CO. STAMFORD, CONN. U. S. A." is stamped on the reverse of the case. Mfg by: Yale & Towne Mfg. Co.
"CGCo". 3" high x 2" wide x 3/8" deep. Stamped steel case. Steel shackle. Flat split key. Made for: Consolidated Gas Co.
"CM&STPRR CO.". 3" high x 2" wide. Stamped steel case. Brass shackle. Post key. 6 levers. Made for: Chicago, Milwaukee & St. Paul Railway Co.
"C. N. O. & T. P.". 3" high x 2" wide x 7/16" deep. Stamped steel case. Steel shackle. Post key. "C. N. O. & T. P." is stamped on the obverse of the shackle. Made for: Cincinnati New Orleans & Texas Pacific Railway Co.
"CORBIN SIX LEVERS". 3 1/8" high x 2" wide x 3/8" deep. Stamped steel case. Steel shackle. Post key. 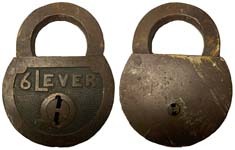 Mfg by: Corbin Cabinet Lock Co.
"CORBIN SIX LEVER BELLVILLE ONT.". 3 1/8" high x 2" wide x 3/8" deep. Stamped steel case. Steel shackle. Post key. Mfg by: Corbin Cabinet Lock Co., Bellville ONT. "DELAMATER RUSTLESS SIX LEVER". 3" high x 2" wide. Stamped steel case. Steel shackle.